Look below six tips for saving money on your stay at Great Wolf Lodge! Okay. I'll say it again. We LOVE this waterpark! Go, go, go! I can't say it enough. It was so much fun for our entire family, all the way from age 8 to age...well, never mind. 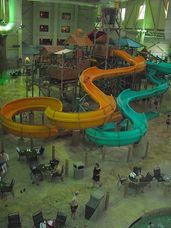 Great Wolf Lodge Williamsburg's fabulous Wave Pool - when the wolf howls, the waves are about to begin! Rates for Great Wolf Lodge Williamsburg vary by the size of the suite (all rooms are suites), date and day of the week. For example, summer rates for a "best available suite" vary, but usually range from about $220 during a weeknight, to $350+ for non-holiday weekends (not including taxes). Yep, you pay more for premium dates. Tip #1: Try the first three weeks after school starts in September, or during April through May. You can often get a suite for $189 on a weeknight. 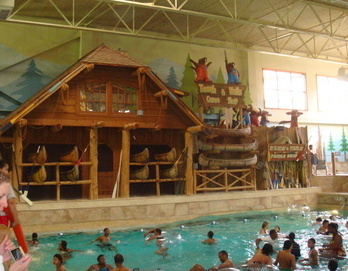 Tip #2: The cheapest time to go to Great Wolf Lodge is on a weeknight. Tip #3: Book early: Prices DO go up. I knew in December that I wanted to go on a weekend in February. Prices were running $249 for a party of five. Alas, I waited until the first week in January to book. Big mistake! The price had jumped almost $100. I had already coughed up the money and made the reservation (and kicked myself), when I got an email from Great Wolf Lodge that they were offering a "48 hour sale." Tip #4: Get on the Great Wolf Lodge email list so you can take advantage of specials and deals. Tip #5: Go in a snowstorm. I'm not kidding. There just happened to be a huge snowstorm bearing down on Virginia the weekend we went. As a result, while the park usually runs at 100% occupancy, we were there when it was only 80% full. You guessed it: Shorter lines and fewer crowds. Plus, when we checked in, they gave us our choice of rooms--1st, 2nd, or 4th floor. My advice? Go with the 4th floor. You'll have a room with cathedral ceilings AND no little feet running overhead about 10 pm. Tip #6: Take advantage of regular discounts. Great Wolf offers 10% discounts to military, fire, police, EMS workers, AAA, and AARP members. You can book online using the offer code HEROES. How long should you stay at Great Wolf Lodge? If you can afford it, your kids would love two days. But honestly, a one night stay was plenty for us. We got there around 3 pm on a Friday, got to the waterpark around 4 pm, and played for three straight hours before getting cleaned up to go out to eat. We could have stayed at the waterpark until it closed at 9 pm, but we were just too exhausted. The next morning, we got up around 8 am, ate a quick breakfast in the room (see more on that below), and were at the waterpark from just after 9 am until Noon. That was PLENTY for us. So what's the best way to get discounts? It's simple. Go to their website. Visit greatwolf.com or call 1.800.551.WOLF (9653). While you're in Williamsburg, be sure to check out the other great area attractions, like Colonial Williamsburg and Busch Gardens Williamsburg. For reviews of all Williamsburg attractions and shopping, and tips for getting discount tickets, click here. Yes, the Lodge has a variety of restaurants right on site. But if you want to save money, or just get out for awhile, here's what we recommend. Make a left out of the lodge down Rochambeau Road and you'll see a Walmart on your left, along with Sonic, Starbucks, IHOP, and Burger King. Go a little further, make a left on Mooretown Road, and you'll see a mall on you left with Chik-fil-A, a Tropical Smoothie Cafe, Quiznos, and Bellisimo Pizza. Chik-fil-A: On Friday nights, buy an adult combo meal and get a kid's meal free. Tropical Smoothie Cafe: On Sundays, buy an adult combo meal and get a kid's meal free. We love the great food and great prices at Pierce's Pit Barbeque. Second, skip the formula food and try one of our favorite local cheap restaurants. On our recent trip, we decided to try Jungle Jim's, the new restaurant in the Lodge's parking lot. The menu seemed pretty similar to Applebee's. But after hours of having to shout to be heard (yes, the waterpark is really noisy), we wanted somewhere quiet. Would Jungle Jim's fit the bill? No. We realized that as soon as we walked in the door and heard a little boy banging on the bongo drums strategically placed near the door. Couple that with the fact that no one offered to seat us? We left. Instead, we took a right just outside the Lodge and headed exactly one mile east (toward Colonial Williamsburg, Busch Gardens, and Water Country USA) to one of our favorite cheap Williamsburg restaurants: famous Pierce's Pit Barbeque. It was a great choice. We were well and truly stuffed (including dessert) for about $35 for the five of us. The next day, after leaving the park, we got similarly stuffed at our favorite all-you-can-eat Oriental spot, Peking Restaurant. Here's the short cut: From the Lodge parking lot, make a right on Rochambeau road and pass Pierce's. Make a right on Airport Road and continue on it about five minutes. At the first stoplight, make a left. Continue on until you see Pirate Cove Miniature Golf on your right, and Kmart on your left. Make a left into the Kmart parking lot and you'll see Peking Restaurant. For our full review of Pierce's Pit Barbeque and Peking Restaurant, click here. 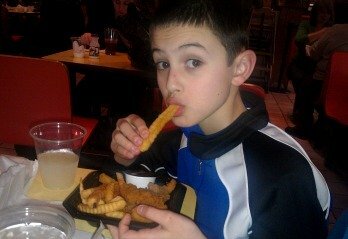 Third, bring your own food. All Great Wolf Lodge rooms are equipped with a mini fridge, microwave, and coffee maker. So we stopped at a local Food Lion and bought our own breakfast food, drinks and snacks.